Uncovering an Urban Legend in Posey Co.
Have martians landed in Posey County? 44News This Morning anchor Tommy Mason tracks down the origins and explanation of a peculiar structure near Mt. Vernon. This is the latest installment of tri-state treasures. 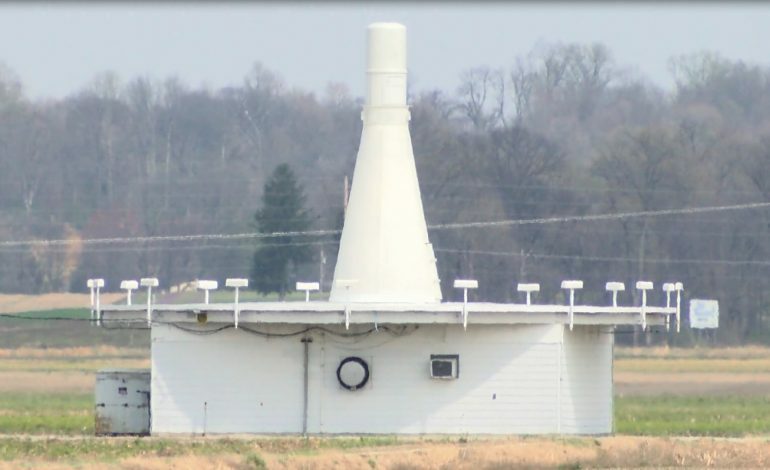 People looking south along Highway 62 in Posey County might notice an odd shaped structure. Some suggest the object is that of a crash UFO, or perhaps a martian landing base. Lending to this urban legend, the fact that the isolated object sits in front of Marrs Elementary, where the school mascot is that of a comet. Nearby neighbors have their own descriptions. So if it’s not a tribute to league bowlers in the tri-state, and it’s not of alien origins, what is it? For a definitive answer we go 15 miles to the northeast. Chad Lemon with Tri-State Aero said it does have a connection to flying objects. “Its not quite a space ship, it does have something to do with aviation. That station is a radio navigation station. And its called a VOR. It stands for VHF Omni-directional range. And what it is – is a radio navigation station that pilots can tune in, and they can navigate to it, from it, or any direction to or from it, to go into this airport or any of a number of airports in this area, or others,” Lemon said.